I promised myself that I would never EVER in my life send a blog, and for sure never have a blog website. So why do I have one now? 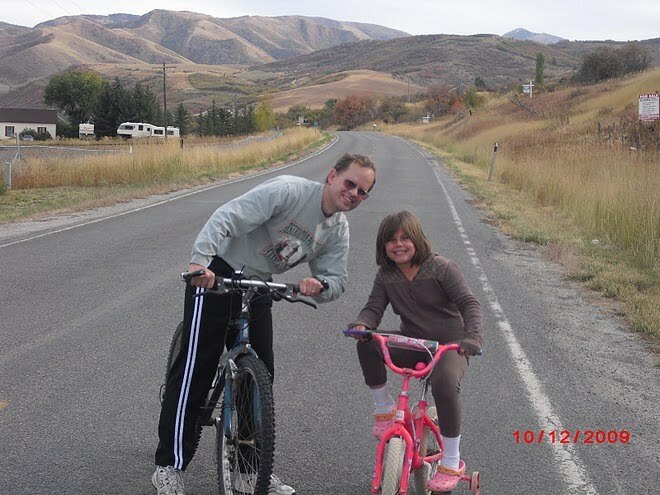 By the way, did I mention that I am riding a bicycle across the United States in the summer of 2010? But that is not the main reason that I now am the proud owner of my very own blog website (you should envision a big smile on my face at this moment). So what possessed me to try and ride a bicycle across America and to start a blog site? It is a long story but I will try and make it brief. My wife and I were married for 14 years before we were able to adopt our oldest daughter, Marcela. Before Marcela was adopted she lived in an orphanage in Bolivia. At age 12 she came to the United States to have back surgery to help correct sever scoliosis. As a result of her health condition, she had major complications during the surgery. Much of her leg muscles began to die and had to be surgically removed. She had seven life-threatening surgeries in the following two weeks and spent six weeks in ICU. It was truly a miracle that she lived, but it appeared that she would never be able to walk again. After five months of intense physical therapy in the hospital, Marcela was able to leave in a wheel chair. Through much more hard work, prayer, and determination she eventually was able to reach her goal, which was to walk across the stage, as she received her high school diploma. Today Marcela is married, living a very successful life, and attends college. My wife and I adopted another girl from the same orphanage in Bolivia and a third girl from eastern U.S. All three have been helped tremendously, free of charge, by Shriners Hospitals for Children. Now back to the question, why start a blog and make a long grueling bicycle ride across the country? 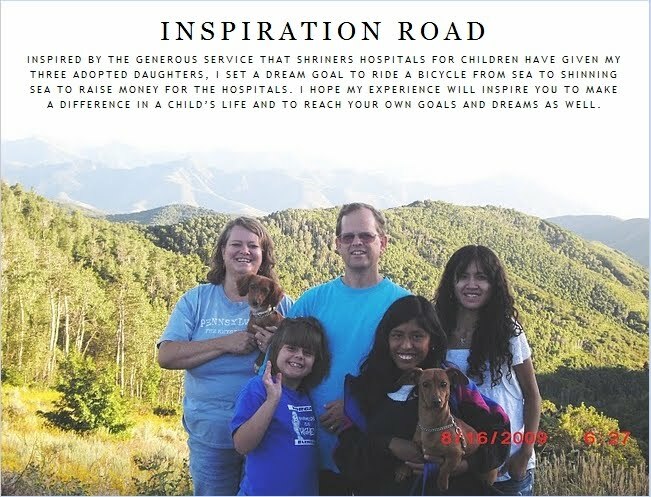 I want to meet this challenge and dream for my girls, for Shriners Hospitals, and for myself. I am pedaling several million times…(drum roll please) to raise money for Shriners Hospitals for Children to give back for all that they have done for my family and many others. My family and fellow biking compainion will also be speaking to groups across the country about our personal miracles, overcoming challenges, promoting patriotism, and stressing the importance of upholding the traditional values that made our country strong. We hope to inspire and uplift others. to feed skinny Willard. This will give you an opportunity to donate to help our pedalers (legs) to keep going strong for two and a half months. There are two of us riding: myself age 46, and Skyler, age 17. My wife and daughters will be our support vehicle, traveling by trailer along with us all summer. Each day they will be driving ahead to meet up with those in our next destination to advertise, and to confirm speaking engagements. Your donations will also help with the cost of bicycle parts, tools, equipment, maintenance, gasoline, propane, etc. It takes so much to make this happen and we want to thank you for your support. Together we can do it! (If you prefer you can mail a check made out to: Golden West Credit Union. Include the account number: 225233. Mail to: Golden West Credit Union P.O. Box 1111, Ogden, UT. 84402). Please join us on an adventure inspired by my daughters and the dreams that America is made of. See what we see, feel what we feel, and meet the challenges that we will face. Lets take this journey together and help change the lives of children across this great country. P.S. Check back right here every couple of months to see what new developments have transpired. Then when I begin my trip in late May I will give a day-to-day account of the wonderful places we go, the amazing things that we see, and the exciting experiences that we encounter. I want you to feel as if you are riding along with us sharing the same wonderful experiences with us as I record them in this blog. See you in a few months… Newer Posts. Click here if you want to ride a leg of the trip with us (Individual or group riders). Click here if you want to schedule a free speaking engagement. Click here to contact me or see my profile (and Skyler's profile too). My training bike (not the pink one, the other one).